Becky Lynch has been invited back to Raw tonight by the McMahon family despite assaulting two of its members last week. Lynch punched Stephanie McMahon on Raw and then slapped Triple H the following evening on SmackDown after being suspended for failing to receive medical clearance for her knee injury. On her way out of Raw, Lynch found herself on the receiving end of a scathing promo from Ronda Rousey - who she has selected as her WrestleMania opponent - who advised her to use some "ice and Advil" to clear up her injury. The effects of that prescription could be seen on tonight's Raw, where Lynch could make an appearance despite remaining under a WWE suspension. She has been working with a crutch at recent non-televised live events and it won't have escaped any member of the McMahon family that such an instrument also makes a pretty handy weapon. Finn Balor defeated Lio Rush last week - will that be enough to earn a crack at Intercontinental champion Bobby Lashley? Balor in line for IC title shot? Intercontinental champion Bobby Lashley told Finn Balor last Monday that if he provided adequate entertainment in his match against his hype man Lio Rush, he would earn a chance to challenge for the red brand's workhorse title. We're not sure if "entertained" is the right word for how Lashley was feeling when he saw Balor pin The Man of the Hour, but it seems like The Extraordinary Man has adequately earned his opportunity. Will Lashley therefore agree to face the popular Irish competitor with the gold on the line, potentially at Elimination Chamber on Sunday night? What next for Kurt Angle? Last week, it seemed as though WWE Hall of Famer Kurt Angle was about to end his in-ring career, with an 'announcement' advertised but then interrupted by Baron Corbin and Drew McIntyre. Their disrespect for Angle led to him battling the pair alongside Braun Strowman in Raw's main event. 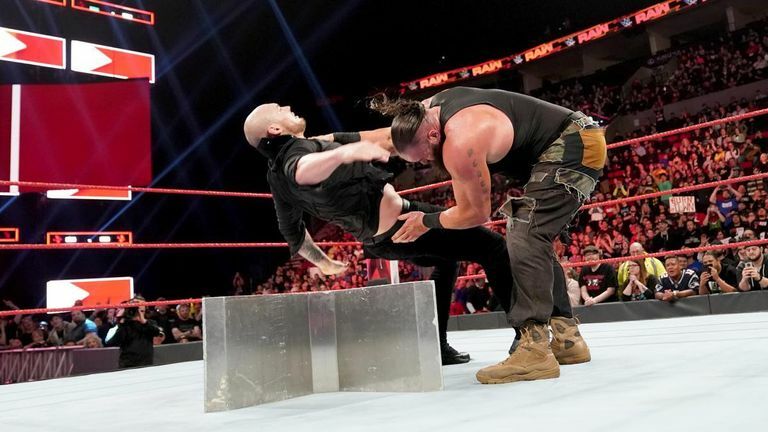 Although Angle and The Monster Among Men were defeated via disqualification, they stood tall at the end of the night after Strowman chokeslammed both opponents onto the steel steps. Will this chaotic turn of events change Angle's mind about his future in WWE?